Here we are in our last day in Stockholm! We did manage to see a lot of places and to get a taste of this beautiful Nordic city. There were still a lot of places to see and visit, but we left our last day for relaxing on some boat trips. We had an amazing weather, very sunny and warm, just perfect for being out on the sea. We took two boat trips that lasted almost all day long (both were included in the Stockholm pass). First one was the Royal Canal Tour. It’s a one hour boat tour through the picturesque Djurgården canal, along the shores of Saltsjön and that goes near all the major attractions of Stockholm. It also has an audio guide so you get to hear a description of all the places you pass by. It’s a nice tour as you get the chance to see the city from a totally different perspective. Next, we took the 3 hours Vaxholm Boat Tour, which allowed us to see the outskirts of Stockholm, the beautiful Stockholm Archipelago and the incredibly beautiful vacation houses in the archipelago. 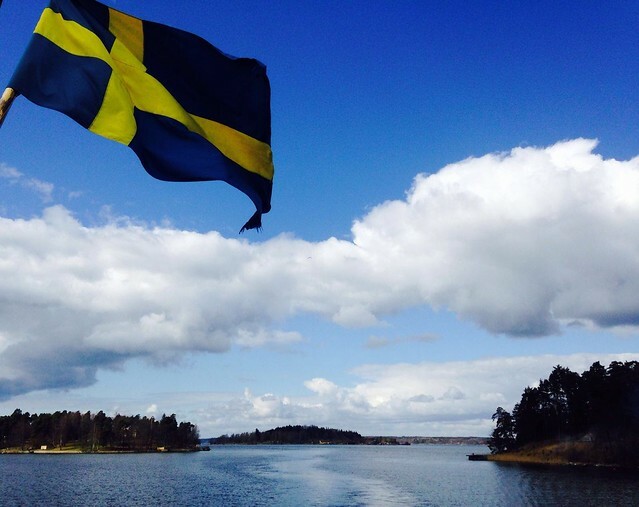 The boat goes through the archipelago and turns around the Vaxholm island. The sourroundings of Stockholm are just breathtaking, even more on a sunny weather. So many green areas, so much fresh air, it’s like you actually forget that it’s right next to a city capital. At the end of the day, after the boat tours, we went up to the Skinnarviksberget. The highest natural point in central Stockholm is a favorite place among the locals for picnics and parties under the open sky. The views are stunning – across Kungsholmen, Gamla Stan (Old Town), the Stockholm Town Hall, and other points of interest. This is how our Stockholm trip ended, the next day we had an early flight back home. To be honest, after visiting so many cities in Europe, it’s hard to be impressed by another city you visit. But I guess that Stockholm is a bit different from all the cities we’ve seen so far. Maybe it’s the way people live there, maybe it’s the quiet on the streets, maybe it’s the beautiful scenery, the green areas, the beautiful architecture, that really made us enjoy this city and feel like it’s a really new experience we are living, something that doesn’t compare to the other places we’ve been to.